Who said one-pot comfort food can’t be low calorie? 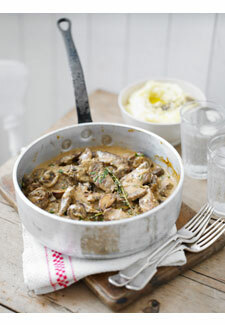 Take just 30 minutes out to cook this deliciously filling mushroom stroganoff for£2.10 per serving. 1. Heat the oil in a large non-stick frying pan and soften the onion for about 5 mins. Add the garlic and paprika, then cook for 1 min more. Add mushrooms and cook on a high heat, stirring often, for about 5 mins. 2. Pour in the stock and Worcestershire sauce. Bring to the boil, bubble for 5 mins until the sauce thickens, then turn off the heat and stir through the soured cream and most of the parsley. Make sure the pan is not on the heat or the sauce may split. 3. Heat rice following pack instructions, then stir through the remaining parsley and serve with the stroganoff. Try adding our tasty, low cal simple spinach salad as a starter – delicious!